(Berne, Indiana) – Family LifeCare (FLC) thanks one of our time-honored supporters – Kayleen Reusser. 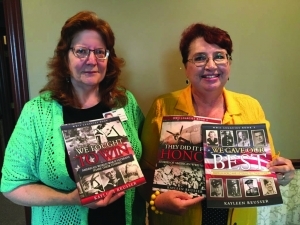 Kayleen donated her newest book – We Gave Our Best: American WWII Veterans Tell Their Stories (World War II Legacies Book 3) – to this year’s fundraiser. Her other two books – We Fought to Win: American World War II Veterans Share Their Stories (World War II Legacies Book 1) and They Did It for Honor: Stories of American World War II Veterans (World War II Legacies Book 2) are also part of two Veteran’s packages we will have which honor our Nation’s Veterans. Kayleen has interviewed hundreds of WWII vets – both men and women along with writing and publishing three books…so far! She also speaks to groups about the WWII tour she conducted in 2017. She is very active in the community and a generous contributor to Family LifeCare’s mission. We also have a special passion for caring for Veterans and 33% of our patient population are Veterans. Kayleen will be at the Allen County Public Library on November 3 from 1-3 pm with her newest book and WWII vets will be in attendance to sign copies and answer questions. Pictured (left to right) are: Lisa Arnold, Development Director and Kayleen Reusser, Author. This year’s benefit – Rockin’ the Night Away – celebrates a 1950s theme and will be held Saturday, October 6 at Lighted Gardens in Ossian. Attendees can dress for the theme, if they wish, and enjoy a great evening including hors d’oeuvres; an elegant dinner; a photo booth; viewing some memorabilia from the 1950s; live and silent auctions; as well as, chocolate, wine, and card raffles. Everyone is sure to have a great time. Proceeds from the event and all donations benefit the FLC Legacy Fund enabling FLC to extend services to community members who are underinsured or have no insurance benefits. With ongoing cuts to Medicare reimbursement and other financial changes brought about by governmental regulations, this endowment fund is critical in meeting the needs of our patients and their families. Your help allows us to continue our mission of bringing hope, comfort and dignity to patients, families, and all who need our services in our local communities. Family LifeCare offers a spectrum of support programs including home health, hospice, palliative care, chronic care management, infusion therapy, Veteran recognition, grief support, and caregiving resources. FLC provides services in Adams, Allen, Blackford, Grant, Huntington, Jay, Wabash, and Wells Counties. FLC provides services to individuals of all ages – from newborns through adults. Our mission is to bring hope, comfort and dignity along life’s journey. We focus on enriching the lives of those that are affected by any chronic to life-limiting illness through compassionate care. Visit us at www.familylifecarein.org and on Facebook at www.facebook.com/FamilyLifeCare.